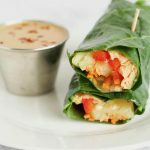 These Asian Collard Green Wraps are filled with a ginger soy chicken, fresh vegetables, and pineapple, and served with a tangy peanut sauce for dipping. A perfect recipe for a light lunch or satisfying snack! Lay collard leaves on cutting board. Top with each with half chicken, pineapple, carrot, and bell pepper. Fold in sides and roll to close. For a meal-sized portion, double the recipe. Toothpicks can help keep the wraps together. Make sure to cut out the woody stem of the collard leaves before filling for easy wrapping and eating.